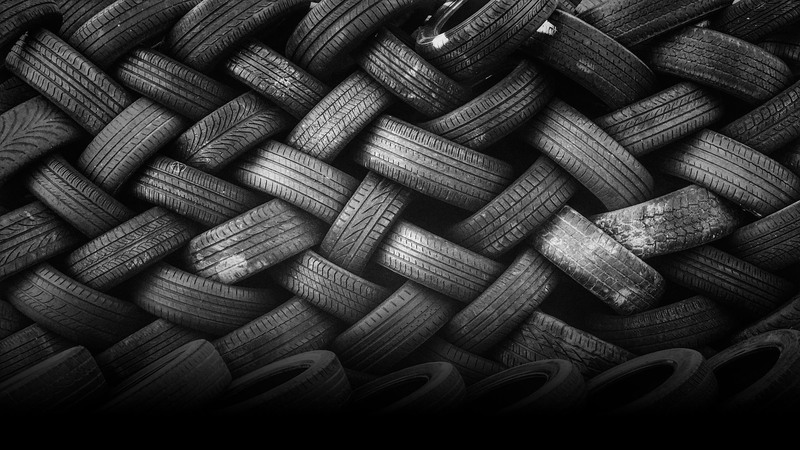 You start with whole tires, tires of any size, you then have to slice and dice the tire in an industrial tire shredder or a tire shredding system. In this data we like to discuss industrial tire shredding systems because a tire system is needed to make a fuel chip. The first concept that must be understood is that an industrial tire shredder is designed much like an office paper shredder, when you put in a whole piece of paper into a paper shredder you get long strips. This is what you get on the first pass through a tire shredder or a tire shredder system: strips. This is a picture of tires that have been sent through a 3” cut primary pass, they are called a rough shred and are not a fuel chip yet. The next step just like paper shredding is to take the primary shred and shred it a second time for the slice and dice phase. However, this is where the discussion will change. Do you make fuel chips using one industrial shredder with a recirculation loop? Do you make fuel chips using two industrial shredders with a recirculation loop? Do you make fuel chips using three industrial shredders with a recirculation loop? Or, do you make fuel chips using four industrial shredders with a recirculation loop? The answer to these four questions is that you can use one or more shredders to make fuel chips, as long as somewhere in the system you have a 2” cutter and you have a recirculation loop system to screen for the proper sized material and a return line to take the oversized product back into the system until it is properly cut to size. The picture above shows the last two shredders and the recirculation loop system a line of four industrial shredders. In this design, the recirculation load is screened under the last industrial shredder and the oversized product is returned to the third industrial shredder to be cut again in the system, first in the third shredder and once again in the fourth shredder before it is screened for proper size. This picture above shows the sizing screen that captures material from the last industrial shredder in this system and screens for proper fuel size. The industry over the last 45 years has evolved from using one shredder, to using multiple industrial shredders to make a fuel chip. The reason for this evolution in shredding is that proper shredding and low cost shredding is best accomplished using a progressive grinding design. A progressive grinding design that is most common today is a four shredder line. The first two industrial shredders in a four shredder line make a 6” initial cut and then a 3” cut in the second machine. The picture above shows the primary industrial shredder in position 1 and the secondary industrial shredder in position 2. If the proper shredder is selected in this design you can bulk feed tires into the system to eliminate labor cost in processing fuel. There are still companies today that offer only one shredder fuel lines and these designs are old, outdated and are not efficient. It’s obvious that many recycling groups can’t afford the proper way to make fuel. Therefore, single industrial shredder lines are still used. But here is the big issue facing everyone: The production rate of industrial shredders. How many tons per hour can you process in a system? That all depends on the design of the system. But let’s start with a one shredder system, which must be setup with a 2” cut to make a 2” fuel chip. All shredders used in single line systems are limited to single tire infeed. Single tire infeed means that the system must be fed one tire at a time on to the conveyor belt. Most single shredder designs can be fed 300 to 500 tires per hour, but they must be able to handle the recirculaton load and that is where everyone makes a mistake. You must shred a tire at least twice to make a fuel chip and in reality the tire is normally sliced almost three times before it is of the proper size. This means that the industrial shredder must be rated for 1000 to 1500 tires per hour internally, a difficult task. Single industrial shredders today produce only 2 tons per hour of fuel chips, regardless of the promises of many groups who make industrial tire shredders. These are real numbers. Double industrial shredder systems produce at a higher rate because they are doubling the cutting ability of the system and today produce 4 to 5 tons of material per hour. But here is the catch: they are normally still fed one tire at a time, and this means that they are restricted by the feeding into the system. Now we expand into three and four industrial shredder lines. The use of three and four shredder processing lines is due to the fact that feeding can be automated and can be better accomplished. Typically larger primary industrial shredders and secondary shredders are used in these systems. By using larger primary industrial shredders, bulk feeding into the system can be accomplished. Therefore increasing production rates of a system to 10 tons per hour. Even if higher production rates are not needed, they are possible in multiple industrial shredder systems and not possible in single or dual shredder systems. Maintenance cost per ton is lower if progressive grinding is used in system design. The picture above is a dual industrial shredder processing line for chip production. The basics of shredding a fuel chips are much like a paper shredder. Using a single industrial shredder system, you must set the machine with a 2” wide cutter. Using a two shredder system, you can set both machines with a 2” wide cutter. Using a three shredder system, you can set the primary machine on a 3” cut and the last two machines on a 2” cut. Using a four shredder system, you can set the primary machine on a 6” cut and the secondary machine on a 3” cut with the last two machines on a 2” cut. A proper design in a four shredder line will use 75 hp for the primary industrial shredder, 100 hp for the secondary industrial shredder, 125 hp for the third industrial shredder and 150 hp for the fourth industrial shredder. We can also design higher speed packages using 150 hp for the primary shredder, 200 hp for the secondary shredder, 300 hp for the third shredder and 400 hp for the fourth shredder. Combined hp for a typical 4 shredder line to produce 5 to 10 tons of fuel per hour is 400 hp for a 10 ton per hour system or about 330kw per hour of input power for a 10 ton per hour system. This is a typical setup of a single shredder design for a rough shred application. The important design feature of all shredders is to have the center to center distance of the two shafts be 610mm or 24” on the spread. This design allows for the proper squeeze distance in the industrial shredder for truck tire processing. Smaller squeeze distances of 16” and 18” are normally used for the final cut shredders in a multiple shredder system. The advantage of the Eidal industrial shredder design is that we build simplicity into our systems. We want to make them easy to maintain. We want to make them easy to operate. We automate the electronics to reduce labor cost. This is a typical single industrial shredder and single Rasper system to make a wire free granule end product for tire recycling. Many fuel users today require a wire free end product and, to obtain this type of fuel, you need to use our Eidal Rasper to take the fuel chip and turn it into a wire free fuel. The advantage of this type of system is that the metal is sold as a commodity worldwide as 30% of a tire by weight is steel. Another advantage of this type of system is that the wire free rubber can then be used for a larger variety of uses and applications for recycling other than for fuel. The future of fuel in a carbon conscious world will drive the recycling of tires into rubber and steel products. Tire recycling system can also be used to recycle wire cable and wood into a recycled product. A tire system can often be used for multiple purposes. This is of importance for many recycling groups who want to install a recycling system. The primary industrial shredder can also be used to shred scrap metal and other bulky items for volume reduction or material recovery.